My alarm goes off. I press snooze. I doze off. It rings again. I roll over, grab my phone and swipe the screen to the right. I check my notifications. Roll out of bed. Walk to the bathroom. Proceed to scroll through Instagram while I brush my teeth. See that a half dozen people have already finished a run before I pressed snooze — but more importantly — see the people who could run, without ya know, injury. 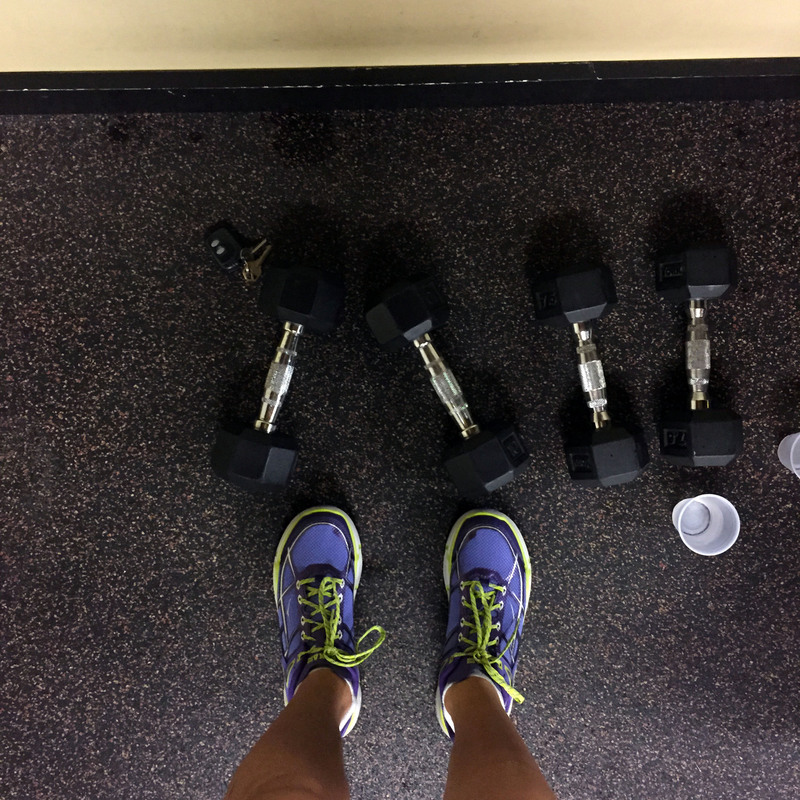 As I wrote in my weekend update, I started to feel some pain and tightness in my calves/shins again, and like the responsible runner I am trying to be, I stopped running. I foam roll. I stretch. I ice when I have time, and I rest. I don’t run. And it’s making me a little crazy. I could be having a truly wonderful day, and yet I can’t shake the feeling that something is wrong. Then I remember: I can’t run. I throw pity parties like a prime hostess and dream about the time when I could run without pain like I linger on thoughts of a beach vacation or winning the lottery. It’s a little crazy; I know. Rationally, I know that these thoughts don’t help, and that it’s not healthy to wade into the negativity — I have the power to end my whining. I understand that a couple days of rest is infinitely better than getting really hurt and sidelined for longer. I have been there; and it’s a lot worse than taking an intentional break. As I write this, I know that my legs have improved with the rest and attention I have given them, and I hope to be running again soon. I just needed to purge how these “no running” blues feel. It is frustrating to sit on the sidelines and resort to a plan B, but it continues to humble me. Tying a bit of my happiness to running isn’t a sure bet 100% of the time, but when those big + little milestones come rolling in — they really are worth dreaming of and working toward. How do you stay positive when you can’t run? Happy Monday, everyone! I’m linking up with Tara at Running ‘N’ Reading and Katie at Marvelous in my Mondays for this week’s weekend update. Hi, friends! As you may have noticed, Ice Packs + Races had a tiny face-lift. I have started and dropped my share of personal or travel blog endeavors over the course of several years, even starting this blog on Tumblr before committing to WordPress, but this one is here to stay. Anyway, let’s get to the weekend update, shall we? I worked every day at the store this weekend but still managed to fit in the good stuff: an indulgent brunch (looking at you, lemon/raspberry compote pancakes), a couple movies, and a little retail therapy. Unfortunately, I didn’t take a lot of photos this week, so I might include a few from Thursday evening (which is practically the weekend, right?). 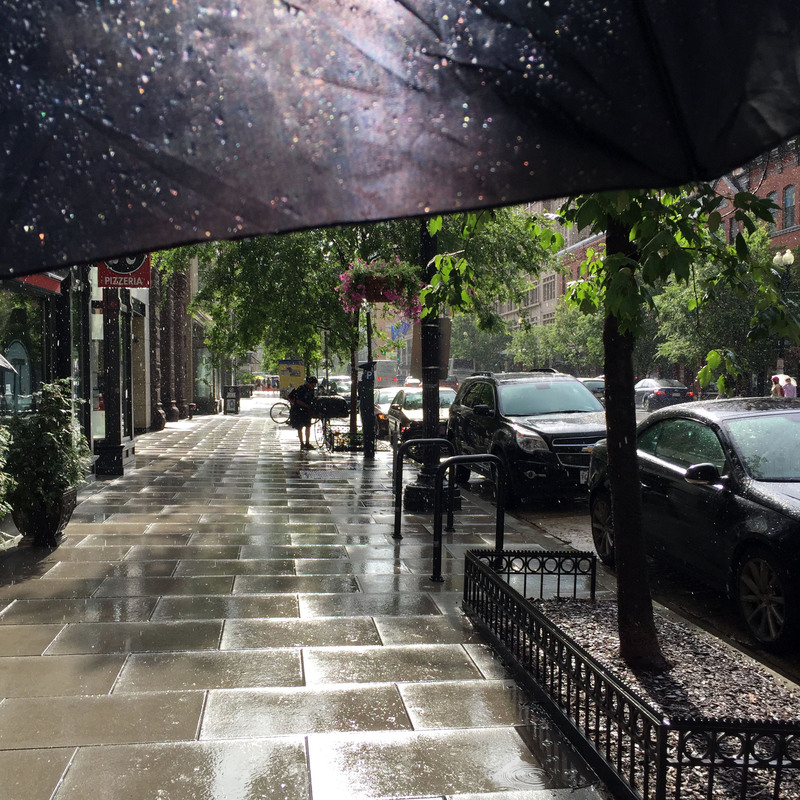 The weather in DC has committed to blazing heat and humidity, but in this occasion it chose bright sunshine and pouring rain — at the same time. What? On a more sour note, I started feeling some tightness in my calves and a little shin pain post-Thursday’s evening run. I’ve since stopped running and committed to rest and foam rolling in an effort to convince my legs to cooperate, but I’m a nervous mess that they won’t heal fast enough to begin half marathon training on Monday. They feel much better today, but I don’t want to run until I can’t feel even a twinge of discomfort. Internally I am yelling, “WHY? AGAIN? !” Did I not take enough time off after my 10K race effort? Should I have waited another day before that first two-miler back?! Was it just too much, too soon since my last break from running? I am somewhere between throwing my head against a wall and trying to play it cool. Keep all your fingers and toes crossed for me that this is just a little detour that will resolve itself soon. 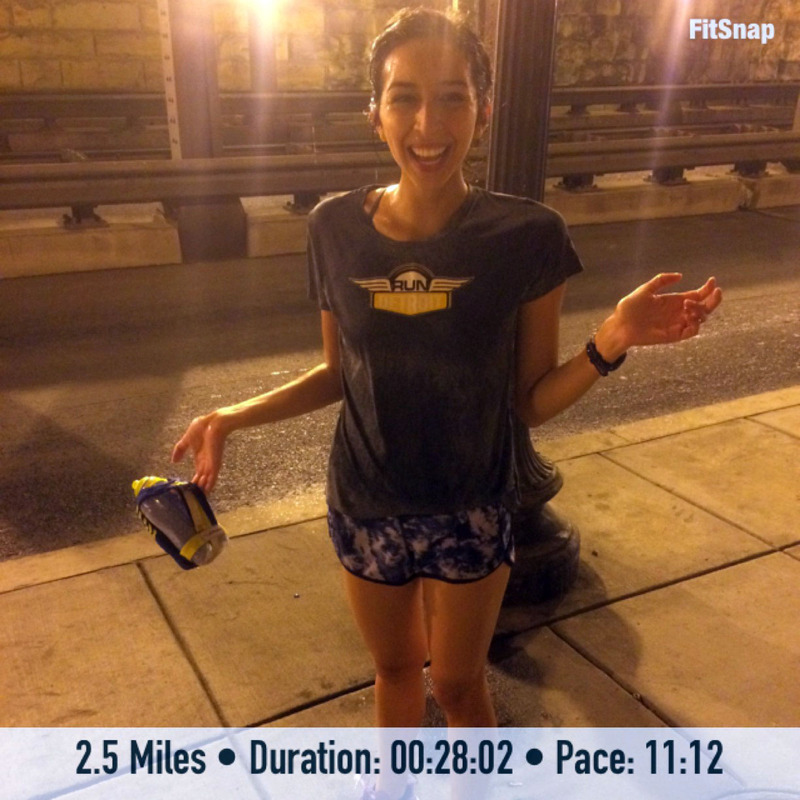 When the sky opens up mid-run…you just keep running. And then pose for a photo when you seek cover. Aside from that speed bump, I tried to keep busy with other weekend activities to keep my brain from obsessing about running. When I wasn’t at work, I took full advantage of my free time. I had my regular coffee and bagel at Buffalo and Bergen on Saturday and shopped for potential wear-to-wedding dresses on F ST. I also may or may not have scooped up a pair of shoes I’ve been eyeing for weeks at Zara. I nabbed them on sale! 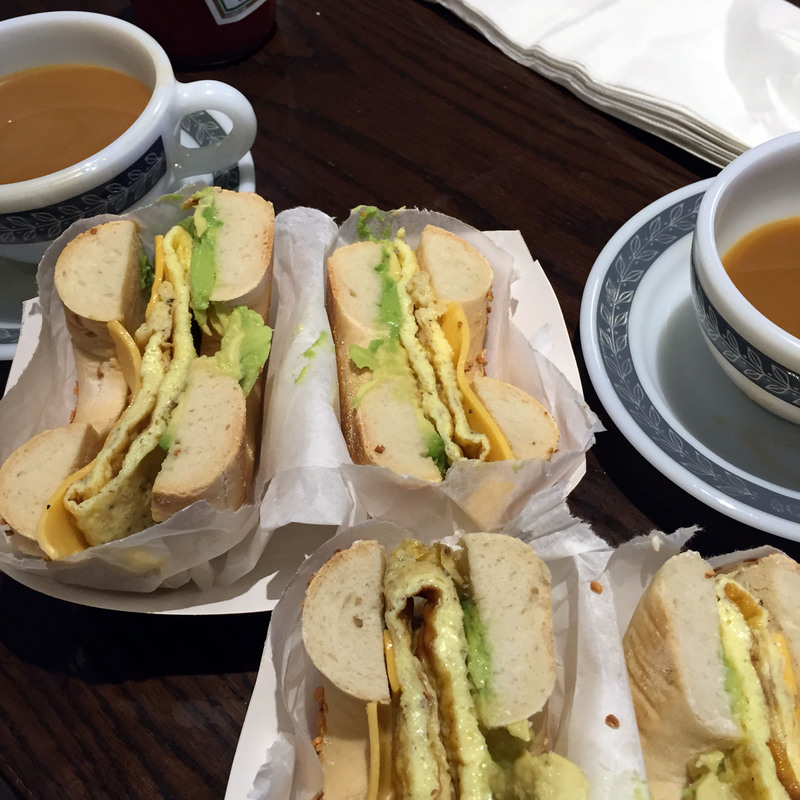 Saturday morning bagels + coffee at Buffalo & Bergen at Union Market. I also squeezed in some weights on Sunday. If I can’t run I might as well do what I can, right? I also took out my new Hokas (which actually deserve a long trail run — the original, pre-injury plan) for a short walk on the C+O trail on the way to and from brunch at Kafe Leopold. After writing about that place in last week’s Friday Five, I couldn’t turn down an opportunity to go. I ordered fruit, hot Austrian coffee topped with fresh cream, and my favorite lemon soufflé pancakes with raspberry compote. I also nibbled off of Alex’s avocado toast and eggs to satisfy my savory craving. I love that place! Plus, throw in a short, fifteen minute wait during Father’s Day Sunday and primetime brunch hours, and I was a happy camper. How was your weekend? How do you stay busy when you can’t run?